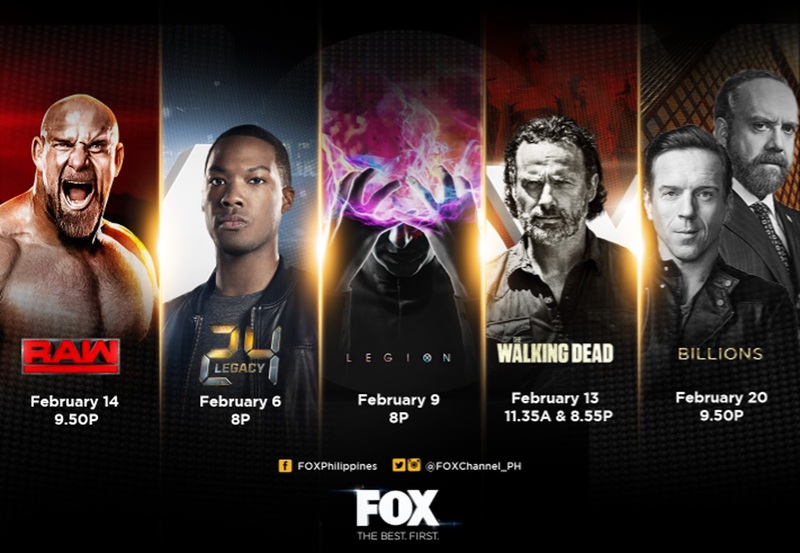 February proves to be an extremely exciting month for FOX Philippines as the channel announces the premiere of several hit US television series. Several FOX shows are returning to the channel in February, including The Walking Dead, Billions, and WWE’s wrestling programs, while new shows Legion and 24: Legacy are set to bring more prestige to an already strong lineup. To promote this huge boost in programming, FOX is teaming up with Philippine escape room game Breakout to host an experience called FOXtreme Breakout, which will bring elements of these shows closer to viewers in a unique escape room challenge that will run from February 9 to 12 at Uptown Mall in Bonifacio Global City. The new and returning television shows that will be premiering this month on FOX all have day & date telecasts and are based on exciting, adrenaline-pumping content. Legion is based on a Marvel comic book that follows the life of David Haller, who is diagnosed with dissociative identity disorder and soon discovers that he’s a powerful mutant—probably one of the most powerful that’s ever lived. Starring Dan Stevens (Beauty and the Beast, Downton Abbey), this 10-episode limited series premieres in the US on February 8 and in the Philippines on FOX on February 9 at 8 PM. Another exciting release on FOX is 24: Legacy, a spin-off of the hit TV show 24. The series stars Corey Hawkins and Miranda Otto and follows the story of Eric Carter, an ex-Army Ranger who is being sought by a terrorist group and tries to stop one of the largest attacks to potentially happen in the US. This heart-stopping 12-episode series will show exclusively on FOX and premiere in the US on February 5, with a Philippine premiere on February 6 at 8 PM. Meanwhile, the highly successful series The Walking Dead returns to FOX on February 13 in the Philippines at 11:35 AM simultaneously with the US, with an 8:55 PM replay for viewers in the evening. This mid-season premiere continues the explosive Season 7 of the zombie apocalypse-based show. Billions is also returning to FOX for its 13-episode second season, premiering on February 20 at 9:50 PM exclusively on the channel. FOX is also the Philippines’ Home of Wrestling, with its wide roster of WWE titles such as Raw, SmackDown, and Royal Rumble. On February 14, FOX’s local production Wrestling Gods adds to the channel’s testosterone-fueled wrestling mania when it premieres at 9:50 PM. 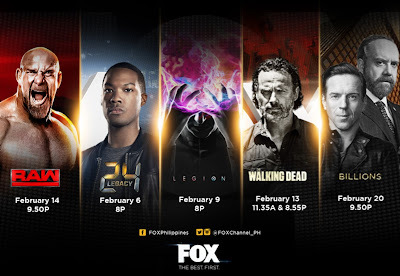 Viewers can also experience all these great shows on FOX up close by joining the FOXtreme Breakout challenge at the Ground Floor of Uptown Mall in Bonifacio Global City from February 9 to 12. The channel teamed up with premier escape room game Breakout to create a series of interconnected rooms that each emulate the look and feel of the shows premiering in February on the channel. Teams of four will have about 20 minutes to finish going through the experience, in which they’ll have to fish a key off a “walker” in The Walking Dead room; take on shooting challenges in the 24: Legacy room; play a tough game of rock-paper-scissors with five big wrestlers in the WWE room; test their sanity while going through a mirror maze in the Legion room; and claim their prizes in the Billions room. FOXtreme Breakout is a fun way for viewers to immerse themselves in FOX’s newest and most-loved shows as well as win prizes. Participants can form teams of four and register online at www.breakout.com.ph to reserve a slot and enjoy the game for free. HE FOXtreme Breakout will run in Uptown BGC from February 9 to 12, 2017. FOX is FOX Networks Group’s global flagship general entertainment basic cable channel, promising international audiences “The Best. First” in entertainment programming. The brand is synonymous with groundbreaking Hollywood entertainment and delivers a varied programing schedule that includes comedy, drama, science fiction, action and animation. FOX’s exclusive, original and breakthrough series include The Simpsons, The Walking Dead, Outcast and others. FOX is available as a linear channel and through authenticated FOX Play apps in 31 local languages in over 255 million homes across 127 countries outside the U.S. As a result of its scale and global synergies, FOX was able to pioneer a global day-and-date release strategy for key series, and remains the only international network able to release TV series worldwide at the same time as the U.S. Launched in August of 1993.